Mind Maps are the easiest way to organize your ideas and information. They are very popular in almost all areas of life and activity, and particularly in education area. ConceptDraw MINDMAP is an ideal software tool for learning process. It combines great tools for all activities from organizing to accomplishing learning process - prepare lectures and learning materials, provide trainings and test knowledge with students, make presentations, problem solve, brainstorming, and much more. Any lecturer and teacher want to make their lectures relevant and interesting for students, it is important to keep the attention of students. The Mind Maps will help to explain lecture material, prepare lesson plans and presentations, etc. Looking the ways for effective trainings? Use of Mind Maps and Brainstorming is the most effective way during the trainings to collect and organize ideas. Mind Maps allow the students to systematize and test their understanding of the material that they have studied. Mind Maps for self learning? They are useful and effective, they lets you make the comprehensive, visual illustrations that will allow better memorize new material. In the process of organizing the distance learning for the team, the ConceptDraw MINDMAP is indispensable. It gives the possibilities for remote mind map presentations and for delivering lessons to a remote group via a Skype conference call. Pic. 1. 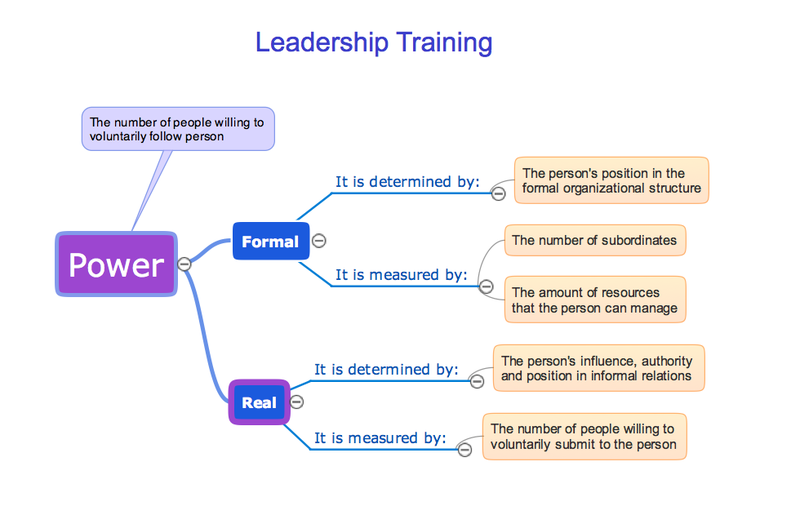 Learning with MindMap - Leadership training. Make the learning process effective and interesting with ConceptDraw MINDMAP ! MindMap Exchange Solution from the Collaboration Area extends ConceptDraw MINDMAP software with the ability to easily exchange mind maps with a large variety of other mind mapping applications. Use ConceptDraw STORE to get the access to the MindMap Exchange Solution.